Airbnb CEO Brian Chesky knows: If you want your company to truly scale, you have to do things that DON'T scale. Handcraft the core experience. Serve your customers one-by-one. And don't stop until you know exactly what they want. Transcript below. “It's really hard to get even 10 people to love anything. But it's not hard if you spend a ton of time with them." “If you're not getting passionate, detailed feedback from some of your users, you're off track." 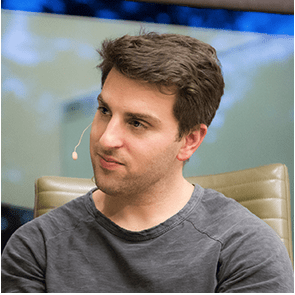 Brian Chesky is co-founder and CEO of Airbnb, the leading marketplace for home rentals with three million listings worldwide. Brian graduated from the Rhode Island School of Design, where he learned how to “design with empathy” for his customers. Patrick Collison is the co-founder and CEO of Stripe, the online payments company used by over 100,000 companies. He won the 41st Young Scientist and Technology Exhibition in 2005 at age 16. Nancy Lublin is the Founder & CEO of Crisis Text Line, which has allowed teens and trained volunteers to exchange more than 60 million text messages. She was previously the founder of Dress for Success and CEO of Do Something Inc..
BRIAN CHESKY: Joe and I are broke. We’re losing weight and I didn’t have a lot of weight to lose. You know those binders that you put baseball cards in? We put credit cards in them. At this point I am $25,000 in credit card debt. Joe is tens of thousands of dollars in credit card debt. So this is make or break. We need a lifeline. REID HOFFMAN: That entrepreneur in need of a lifeline? That’s Brian Chesky. Co-Founder and CEO of Airbnb, a service that lets you rent a couch for the night. Or a cabin. Or a castle. Today, Airbnb is valued at $30 billion. Eight years ago? A very different picture. CHESKY: We have this website and maybe 50 people a day are visiting it and we’re probably getting like 10 to 20 bookings a day. By the way, we’ve been working for a year and a half. So for anyone who’s worried their company doesn’t have enough traction, that was our traction. HOFFMAN: It was 2008. An election year in the United States. Barack Obama was running against John McCain. Brian was at the Democratic National Convention, hatching a PR campaign for Airbnb—one that could rescue the company and their credit card bills. CHESKY: Joe and I look at each other and we said “We’re Air Bed and Breakfast. The air beds aren’t going so well. Maybe breakfast will.” So we thought, what if we could sell breakfast? Maybe we can make some money. What’s a nonperishable breakfast? Cereal. So we thought the presidential campaign is coming up. We just launched at the DNC. What if we created a Barack Obama themed breakfast cereal? And we thought, what would a Barack Obama themed breakfast cereal be called? Obama O’s like Cheerios, “The breakfast of change.” We thought, “Well, we want to be a nonpartisan website so we’d also need a John McCain themed cereal.” John McCain was a captain in the Navy and so we came up with Cap’n McCain’s, like Cap’n Crunch: “A maverick in every bite.” We ended up making a thousand boxes of collectible breakfast cereal. We sold them for $40 a box. HOFFMAN: That’s $40,000. Not bad for pocket change. And it got them through a cash crunch. But it came at a cost. CHESKY: We had to physically make the breakfast cereal ourselves, meaning we get a printed poster board and we had to fold it and hot glue it. No one told me I had to hot glue breakfast cereal and they should call it burn glue because every time you get it on you, you burn you. I had a perfect one to one ratio of burn to box. I literally had to hot glue a 1,000 boxes of cereal. At one point in the middle of the night I remember reading, I wonder if when Mark Zuckerberg started Facebook he had to hot glue breakfast cereal. The answer was no and this was not a good sign. HOFFMAN: But what was a good sign was Brian’s willingness to work with his hands—burns and all. I’d argue that painstaking, handcrafted labor is actually the foundation of his success. In order to scale, you have to do things that don’t scale. HOFFMAN: I’m Reid Hoffman, co-founder of LinkedIn, partner at Greylock, and your host. On this episode, I’ll make the case that the only way an organization can truly scale, is to first do things that don’t scale at all. I’ll try to prove that theory through stories from some of the smartest entrepreneurs I know. Over the last 20 years, I’ve worked on or invested in many companies that scaled to 100 million users or more. But here’s the thing: You don’t start with 100 million users. You start with a few. So stop thinking big, and start thinking small. Hand serve your customers. Win them over, one by one. Now this may sound like odd advice if you’re an entrepreneur with global ambitions. Mark Zuckerberg didn’t personally invite 1.8 billion people to Facebook. He built a great product, and the users just poured in. Right? Not exactly. On this show, I’ll dispel that myth by talking to founders who fought to win their users. I’m starting with Brian Chesky, CEO of Airbnb because he epitomizes the idea of handcrafting the user experience, before you start to scale. It’s a principle he first absorbed in design school. CHESKY: I was doing medical design once. I had to design a children’s ventilator. I had to sit in the shoes of the child. I had to imagine being a child, get in the operating table and you had to put yourself in the shoes of the patient, or the person using your product. If you’re only doing A/B tests you’re never designing with empathy. HOFFMAN: But a funny thing happened to Brian when he moved to Silicon Valley. He sort of forgot about designing with empathy for a single user. It’s a common mistake among entrepreneurs with global ambitions. They have to promise investors the world. Tens of millions of customers. Billions in revenue. It’s intoxicating. Just listen to Brian go. CHESKY: This is a travel industry that is something like seven percent of global GDP, somewhere between five and seven trillion dollars, ten times the market size of Google’s market size. HOFFMAN: And Brian might have stayed in the stratosphere, if not for a fateful meeting with Paul Graham, Co-founder of Y Combinator. SIRI: Y Combinator is a start-up incubator, which cultivates and invests in early-stage companies. HOFFMAN: Brian was admitted into Y Combinator in 2009, and his first meeting with Paul was confounding. Paul tends to stump people with deceptively simple questions. HOFFMAN: So they come up with an offer that host’s couldn’t refuse. HOFFMAN: It is typical to get very detailed feedback from some of your early users. And if you’re not getting some people who say “This is super important to me. I love this. I really need this to work well,” it usually means you’re off track. Passionate feedback is a clue that your product really matters to someone. And one passionate user can turn into many, if you listen to them carefully. It’s essential to get this kind of feedback early, while you’re still defining the product. It’s like setting a foundation as an architect. You wouldn’t build a skyscraper before you’ve build a solid foundation. User feedback ensures you won’t build a dozen floors on an unstable swamp. Brian has a simple method for extracting detailed feedback from users. He doesn’t ask about the product he already built. He asks about the product of their dreams. CHESKY: We’d ask these questions like, “What can we do to surprise you? What can we do, not to make this better, but to make you tell everyone about it?” And that answer is different. If I say, “What can I do to make this better?” They’ll say something small. If I were to say, “Reid, what would it take for me to design something that you would literally tell every single person you’ve ever encountered?” You start to ask these questions and it really helps you think through this problem. HOFFMAN: It’s essential to seek out and listen to user feedback. But the caveat is: You have to figure out which users to listen to. You’re going to have different kinds of users giving you feedback—and some of it will take you in the wrong direction. So you need to exercise judgment in discerning: Will this particular user and particular feedback lead me to the mass market? Or is it an edge case? For example, at LinkedIn, we had one group of users who invented a name for themselves. They called themselves LIONs—which is Linked In Open Networkers—because their theory of the world was that everyone wants to directly connect to everyone else in the world—because that’s the way they wanted it. But they’re actually not the majority case. A lot of people who are very busy, who have access to resources, who have some celebrity status—do not want that. And if we followed their feedback, LinkedIn would not be where it is today. We had to steer away from a bunch of passionate users who told us very explicitly that we were fools for not following their advice. HOFFMAN: Adding stars clearly excites Brian. It took some time to run through this mental exercise. We’ll skip ahead to the ten star experience. CHESKY: So what would a ten star check in be? A ten star check in would be The Beatles check in. In 1964. I’d get off the plane and there’d be 5,000 high school kids cheering my name with cars welcoming me to the country. I’d get to the front yard of your house and there’d be a press conference for me, and it would be just a mindfuck experience. So what would 11 star experience be? I would show up at the airport and you’d be there with Elon Musk and you’re saying, “You’re going to space.” The point of the the process is that maybe 9, 10, 11 are not feasible. But if you go through the crazy exercise of keep going, there’s some sweet spot between they showed up and they opened the door and I went to space. That’s the sweet spot. You have to almost design the extreme to come backwards. Suddenly, doesn’t knowing my preferences and having a surfboard in the house seem not crazy and reasonable? It’s actually kind of crazy logistically, but this is the kind of stuff that creates great experience. HOFFMAN: But how far do you go toward the 11-star experience? To create the nirvana product, all successful entrepreneurs, at some point, have to come back down to earth. CHESKY: There’s really two stages of a startup’s product. The first is design a perfect experience and then you scale that experience. That’s it. HOFFMAN: But which part of the perfect experience do you scale? The most ambitious entrepreneurs—let’s call them the Elons, after my friend Elon Musk—probably get there through raw energy because they’re convinced they need to solve a problem, and the unscalable thing is one step they have to push through on the way. The Elons say, “I’m going to Mars. But first I’ve got to solve this problem right in front of me. First I need to get the rocket launched, and I need to have a business model for that first rocket, and that looks like satellites. OK. I’m going to try satellite launches. And how do I get my first rocket? I need to create a scalable rocket platform, but unless I get the first rocket up, it doesn’t matter. And you work back to that. So how did Brian decide on the doable thing? He settled on a service with the appropriate level of magic, and started building it. And—here’s the next thing to notice: They didn’t launch perfectly scaled services. They built everything by hand. CHESKY: We had a saying that you would do everything by hand until it was painful. So Joe and I would photograph homes until it was painful, then we get other photographers. Then we’d manage them with spreadsheets until it was painful. Then we got an intern. ELLIE THIELE: I don’t think I knew how anything would grow to the level that it did. REID: That’s Ellie Thiele. She’s the intern who managed those spreadsheets. She still works at Airbnb. THIELE: Very manually, I would email the photographer and the host and connect them. The photographer would then send me the photos. I would go through each one giving feedback if they needed to be retouched. Then I would manually upload them to the host’s website, their listing, one by one. It would take hours to upload. Multitasking was the name of the game. CHESKY: And then we’d automate the tools to make her more efficient. THIELE: And we kind of looked at this and we said OK what is the easiest thing that we can automate. Any little thing that changed was quite a shift in what I had been doing—but for the better. CHESKY: Eventually a system does everything. We built a system where now the host comes, they press a button, it alerts our system which goes to a dispatch of photographers, so it’s all managed through technology. They get the job, they market through an app that we built, and then payment happens. The whole thing is automated now. HOFFMAN: Note how they gradually worked out a solution. They didn’t guess at what users wanted. They reacted to what users asked for. Then they met the demand through a piecemeal process. And here we come to the true art of doing things that don’t scale. It’s not just a crude way of succeeding on a shoestring budget. It also gives your team the inspiration and urgency to build the features that users really want. PATRICK COLLISON: We had a chat room where we would help customers with whatever issue that they wanted to ask about. We were very distressed after a while to notice that occasionally people would come into the chat room while we were sleeping and ask questions, they wouldn’t get any response. So we wrote a bot that would page one of us if somebody asked a question they didn’t get a response after 30 seconds, would groggily, bleary eyed, wake up and help them and go back to sleep. HOFFMAN: So in addition to being CEO, Patrick had become Stripe’s bleary-eyed customer service rep. Frustrated users would page him at all hours. COLLISON: It sure did not feel glamorous—tapping away on my laptop for half an hour in bed. HOFFMAN: Actually it reminds me—I don’t know if you know Paul English who founded Kayak. SIRI: Kayak is an online travel service that finds the lowest available rates across different websites. COLLISON: We know each other a little bit. HOFFMAN: Paul for a number of years in Kayak had his cell phone number as the customer service number. COLLISON: There was someone at Stripe who did exactly the same thing. HOFFMAN: Now it’s common for entrepreneurs to swap stories like this. And I think it’s worth dwelling on these early days of handcrafted work, because most entrepreneurs tend to have a funny reaction to these experiences. They may laugh about it later. They may call the work unglamorous. They may celebrate the day they could hire a helping hand or automate these chores out of existence. But thoughtful founders will never say, “What a complete waste of time.” They’ll often look back on this period as one of the most creative phases of their careers. Nancy Lublin, for instance, scrappily launched an international non-profit from her New York City apartment. Her organization, Dress for Success, started as a clothing drive for women who needed to walk into a job interview looking sharp and feeling confident. Nancy stockpiled sweaters on her bed and jewelry in her refrigerator. And soon she was inviting volunteers into her apartment for informal training sessions. NANCY LUBLIN: So people start hearing about Dress for Success and would contact me, random people would contact me and say, “I want to start this in St. Louis. I want to start this in Hartford.” I would say, “Great, you want to come stay with me?” People, literally strangers, would fly from St. Louis and stay on my futon, my college futon in my tiny, law school apartment in New York and I’d be like, “How can I help?” I would send them postcards saying, “Don’t give up. I know it’s really hard. You’ve got this.” I just killed them with kindness. HOFFMAN: Today, Dress for Success has affiliates in 145 cities worldwide. But let’s be clear: The transition from the handcrafted phase to the massive scale phase is a challenging one. And I want to dispel any illusions that you can switch from one to the other with ease. In fact, it requires two opposing mindsets. You have to fully empathize with a single user. At the same time, you have to worry about everyone. I like the way that Brian describes the difference. CHESKY: The designing of experience is a different part of your brain than the scaling your experience. It’s a different skill set. The scaling experience is a highly analytical, operations oriented, and technology oriented problem. The designing of experience is a more intuition based human, empathetic, end-to-end experience. HOFFMAN: One parallel might be writing and editing. So the handcrafted phase tends to be more like writing: It’s a more inventive and creative process. Whereas the scaling phase tends to be more analytical. It’s more like being an editor. At that point you tend to do more pruning. You realize: “Well this whole thing is magical. But if we focus on this 20 percent, we get 80 percent of the magic.” So you prune. You compact. You distill. And you architect, so it can now run at a rocketship rate. You’re transitioning the product or service over to a scale organization that can now run it. The organization needs a simple plan with very few errors and very little improvisation. Now you might think the first step—design the ideal user experience—drops away as soon as your product goes viral. Then comes the glamorous work of expanding to new countries and thinking about your strategy in the years ahead. Handcrafted work is essentially a kind of booster rocket that helps you get into orbit, but it’s not the rocket for the whole trajectory. It gets you out of the gravity well. And after that, get ready to slingshot around the world. CHESKY: We became an international company. Then in the middle of 2011, we raise money, we’re this billion dollar valuation company. Then in summer 2011, a woman’s home got trashed. Then we had to go to the next step which was: we are just this little company in our apartment, but as far as the world’s concerned, we have a giant office building and we better be grownups. So we had to build 24/7 support, had to have more secure payment instruments, we had to add a trust and safety team, we had to verify people’s identity. We realized we had to get our money transmission licenses. So then there’s this whole administrative bureaucracy that gets added. Then 2012 we get to the point, where we have 50, 100 employees, and we have no executive team. There’s no management, there’s no company meetings, and there’s no communication so no one knows anything, literally nothing. I don’t even know how we ran the company. So I instituted some basic things like I have to have an executive team. And then the lawsuits come in and you have to really sort it out. Unfortunately we’re not regulated at the federal level. We’re regulated at the city level and every city is different. They’re like, “I see what you did in Paris but here in New York we’re different.” So you had to go city by city and you’ve got to hire those people to really triage and deal with all these issues. It’s like a videogame. You slay a dragon. You think you’ve completed the board game, and then you have the next level and all of a sudden the dragons get really big. HOFFMAN: When you’re slaying dragons, it’s hard to hold on to the handcrafted mindset. Still, I would argue that the sharpest founders never fully abandon the mindset, no matter how big their company gets. The organization will start having antibodies against new handcrafted things. It’s a response that protects organizational efficiency. It says: “Look, this new thing? We can’t get it to scale. It won’t operationalize. It won’t fit within our process.” The reason that scaled companies have a hard time with this handcrafted process is all in the list of objections about why this won’t work, why this shouldn’t be integrated as part of the company. And so what you need to do as a founder is to be extremely choiceful of which handcrafted innovation you choose, and how you protect it organizationally. You need to protect it because the natural reaction of the scale organization will be to kill it. He wanted to reinvent the industry again, and he knew he had more to learn about the travel experience in order to do it. So he turned to Hollywood for help. CHESKY: I often find that to reinvent an industry, you do not take inspiration directly from that industry, you need to look at orthogonal industries. For us the orthogonal industry for travel was cinema. The best trips you’ve ever seen are the trips that characters in movies have and we would provide that analogy in real life. I actually literally hired a storyboard artist from Pixar. We had him storyboard the perfect Airbnb experience. When we did that we realized there was this two hour movie and only 20- minutes were in the home. There was all this leading up to the home, getting the airport, going around, going to dinner, or hanging out with friends out and about. Most of the trip was not in the home. We realized at that point, we need to be the end-to-end business of travel. So the same way that we did things that don’t scale, we called it “magical trips.” We decided let’s find one traveler and create the perfect trip for them. HOFFMAN: Notice how quickly Brian turns his attention to a single traveller. In an instant, he switches from global concerns back to his artisanal roots. That’s because he’s building something radically new here. He wants to scale the perfect trip. But what is the perfect trip? What are the essential ingredients that make a vacation truly memorable? It’s a question Brian can’t even begin to answer until he delivers that experience to at least one person. You’re about to get a master class in handcrafting. CHESKY: We put up these flyers anonymously saying, “Seeking a traveler. We’ll photograph your trip to San Francisco if you let us follow you.” This guy Ricardo replied. He was from London. We sent a photographer around him while he was just travelling in San Francisco. What we learned was his trip was awful. He’d show up, he’d go to Alcatraz by himself, put on the headset, and then he’d go to Bubba Gump Shrimp. He’d stay in a budget hotel. He’d go to a hotel bar by himself, sitting with a bunch of dudes at the bar but he doesn’t talk to anyone because he was introverted. We call him back. We said, “Ricardo, we want to create the perfect trip to San Francisco for you.” We fly him back. We had the team storyboard the perfect experience for Airbnb. We had a driver pick him up at the airport. We took him to the perfect Airbnb, there are all the services. He went on these dinner parties, we got him the best seats at restaurants. We took him on this midnight mystery bike tour. Sixty riders go on it and nobody but the leader knows where it will end up. There was this crazy magical world. I see him at the end of the trip. I say, “How was your trip?” He says, “It was amazing.” And then I walk away. He yells at me. “Brian, one more thing.” He starts crying. He breaks down, he says, “Thank you. This is the best trip I’ve ever had.” I was like, “Oh my God. I guess it worked. It really moved him.” I don’t think anyone ever tried to design an end-to-end experience for somebody like they’re in a movie before and we did it. That became a blueprint. We said we are confident on an unscalable basis that we know how to create a trip that deeply moved somebody that’s better than anything they’ve ever experienced. The question is: Can we develop a technology that scales and do it 100 million times? HOFFMAN: Notice here how quickly Brian switches back to the analytical mindset. He can extrapolate from a single journey to a list of essential ingredients. Here is his systematic breakdown of the perfect trip. HOFFMAN: In November of 2016, Brian unveiled 500 trip packages in 12 cities. And now he’s fully in the scaling mindset, figuring out how to expand the service to new destinations. But as Brian will tell you, he misses the handcrafted work. He has a surprising message for entrepreneurs who have only a handful of users to serve. CHESKY: I tell a lot of entrepreneurs who don’t have traction, I miss those times. Yes, it’s exciting to have traction, to have a company that’s huge scale, but the biggest leaps you ever get is when you’re small. Another way of saying it is, your product changes less the bigger you get because there’s bigger, more customers, more blowback, more systems, more legacy. The most innovative leaps you’ll ever make, especially if you’re a network, are going to be when you’re really, really small. You can change the product entirely in a week. Try doing that at LinkedIn or Airbnb today. That would be a huge disaster. So I think taking advantage of that subscale, designing the perfect experience, asking yourself what you can do, is amazing. HOFFMAN: And if you have a tiny startup, I have good news for you. Now is the moment you can take the most daring leaps of your career. Dream big. And act small. Pay passionate attention to your users. Handcraft the core service for them. Create a magical experience. And then figure out what part of that magical handcrafted thing can scale.